Night sky photographer Guy Strong combined 30 images of the 2013 Perseid meteor shower to create this composite view using observations captured between Aug. 11 and 12 in 2013 from Leelanau County Michigan on Lime Lake. One of the year's most dazzling meteor showers peaks overnight tonight, and you can watch the shooting star display online if clouds or bright city lights ruin your view of the sky. The 2014 Perseid meteor shower should be at its most spectacular late Tuesday into early Wednesday (Aug. 12 to 13), experts say. If bad weather or city lights spoil your view, you can see the Perseids live online courtesy of the Slooh Community Observatory and NASA. The first of the two free webcasts of the meteor shower begins at 7 p.m. EDT (2300 GMT) on Slooh's website, http://www.slooh.com. You can also watch the Perseid meteor shower webcasts live on Space.com, courtesy of Slooh and NASA. Slooh's show will feature views of the night sky from a telescope in the Canary Islands, off the west coast of Africa. "This is the best-known and most beloved meteor shower. Though bright moonlight will affect the 2014 Perseids display, we will nonetheless be able to dramatically observe them all night long, and their superfast speeds as they collide with Earth's atmosphere at 37 miles per second," Slooh's Bob Berman said in a statement. "Our accompanying narration will explore various little-known aspects of these visitors from space, which are debris from Comet Swift-Tuttle," Berman added. NASA, meanwhile, will stream live shots from Marshall Space Flight Center in Huntsville, Alabama, beginning at 9:30 p.m. EDT (0130 GMT). At 11 p.m. EDT (0300 GMT), NASA's Meteoroid Environment Office chief Bill Cooke will host a live online chat with colleagues Danielle Moser and Rhiannon Blaauw. You can follow the NASA webcast and online chat here: http://www.nasa.gov/watchtheskies/perseids-2014.html#.U-oCUfldWSo. Observers in the Northern Hemisphere will have the best views of the Perseids tonight, NASA officials said. Viewing conditions get worse as you get farther south of the equator, with parts of southern Australia and South America shut out completely. This NASA graphic is a visibility map for the 2014 Perseid meteor shower around the world. As Berman noted, the Perseids occur every August when Earth plows through a stream of debris shed by Comet Swift-Tuttle, which is about 16 miles (26 kilometers) wide and completes one orbit around the sun every 130 years or so. The Perseids are one of the best and most reliable of the annual meteor showers. They received their name because they appear to radiate from a point in the constellation Perseus. 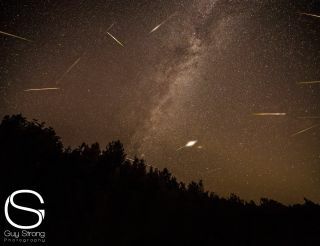 Editor's Note: If you snap an amazing picture of the 2014 Perseid meteor shower or any other night sky view that you'd like to share for a possible story or image gallery, send photos, comments, and your name and location to managing editor Tariq Malik at spacephotos@space.com.